A One-Day Conference launching Volume 29, Studies in Polish Jewry (Littman Library of Jewish Civilization). In cooperation with Polish Cultural Institute, London, the Embassy of the Republic of Poland, and the UCL Institute for Jewish Studies. Volume 29 of Polin: Studies in Polish Jewry investigates Jewish historiography in three East European hubs: Congress Poland, the Russian Empire, and Galicia, in the nineteenth and twentieth centuries. Looking beyond established paradigms, it adds to a growing literature seeking to transcend the trope of Jewish cultural insularity. 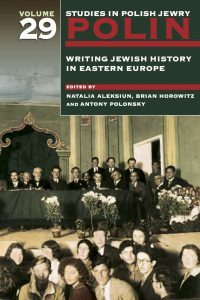 It explores the tension inherent in the writing of Jewish history in Eastern Europe: between exploring the Jewish past in its communal setting, or inscribing Jews into the wider social, political, economic and cultural fabric of the region. The event will feature two panels with presentations by the editors and authors of the volume, and a roundtable with Norman Davies, Edyta Gawron, Jan Kubik and Antony Polonsky. It will conclude with a slide show by Natalia Romik (UCL Bartlett School of Architecture) about her trip with the Nomadic Shtetl Archive through small Polish towns in the summer of 2016.